I'll show you how to make some very easy and quick pirate cupcakes for a themed pirate Halloween party or birthday celebration. You'll find out how to decorate either your own homemade or some ready-made cakes that you've bought with a simple, fun and easy treasure theme. 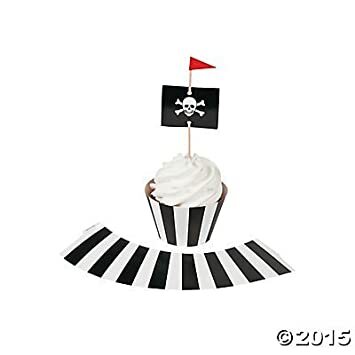 These really eye-catching pirate cupcake designs can be made by anyone from young kids with supervision to adults. They look tempting enough to go on show for a birthday or other occasion. You can create these cake designs even if you can't actually cook. The whole focus is on getting the decoration right and not whether or not you're great at baking. So come and see how you can make this popular sweet treat for your budding little swashbucklers. Above all, enjoy it and have fun. 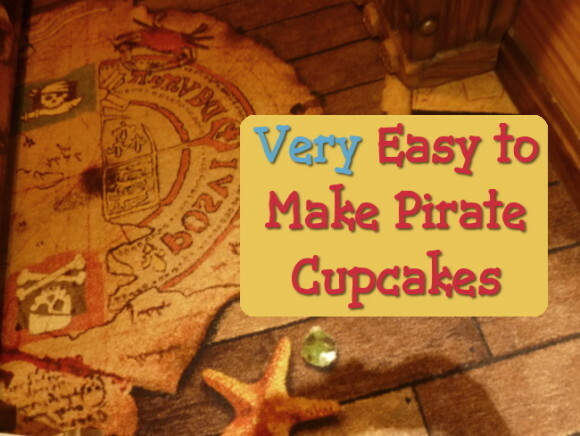 These easy to make pirate cupcakes also makes a great activity for children to do as a group. Certainly, we've had a lot of success with pirate cake decorating activities for my own daughter's parties although you'll want to provide aprons for this as it can quickly get very messy. Stick lots of lubberly treasure on top of your frosted cupcake. 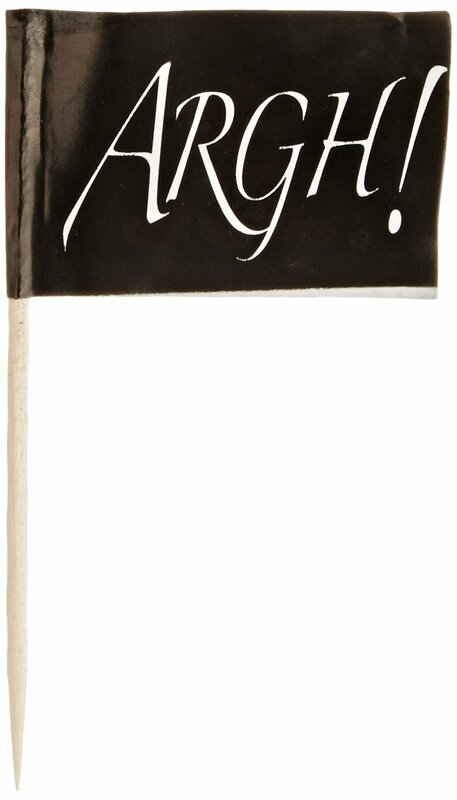 This is fun activity for kids to do at a Halloween or pirate party. Step 1: You need to make or buy some frosted cupcakes. Whether you're making your own cakes or purchasing some, you need cupcakes that have a soft frosting on top. A buttercream frosting for example should be soft enough so that you can press your candy and treats on the top. Because I'm not terribly into baking, I just bought mine from the local grocery store. Step 2: Gather together a selection of edible candy pirate treasure. Foil wrapped chocolate coins are perfect, mini eggs or candy wrapped in pretty colored foil, bright colored candy like jelly beans, sprinkles, chocolate buttons and perhaps even licorice twists. Any candy and chocolate that's bright and shiny and will pass as pirate treasure like coins and gemstones is a must. Candy skulls and bones give it enough of the creep factor for Halloween. Step 3: First place your largest foil wrapped edibles into the cupcake frosting and press them in hard enough so they won't easily fall out. You can test this by holding the cupcake upside down. Step 4: Now start adding the smaller chocolates and candy by pressing them around the chocolate money. You really want to cover as much of the cupcake frosting as you can. Step 5: Shake a generous portion of little sprinkles over each cake. 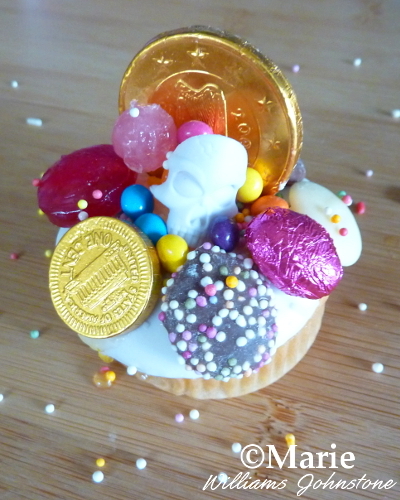 I also added in a candy skull which goes very well with the pirate treasure theme. And the cupcakes are done. See how easy and fast that was. Now for some extra ideas below. 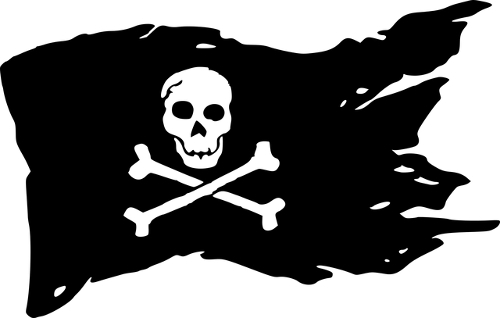 Print off some tiny pirate pictures such as Jolly Roger skull and crossbones designs, you can find some good ones on pixabay.com, and stick these with tape to toothpicks. You can add these to the top of your cakes. 1: Make a Secret Treasure Map: How about rolling up tiny rectangular pieces of paper and tying them with string to look like treasure maps. You can pop those on top of your cakes too. For edible versions, buy ready to roll fondant icing which you will need to roll out thin and then cut out rectangles which you can roll up. In a different color, roll a very small piece of fondant into a thin sausage and wrap around to look like string. 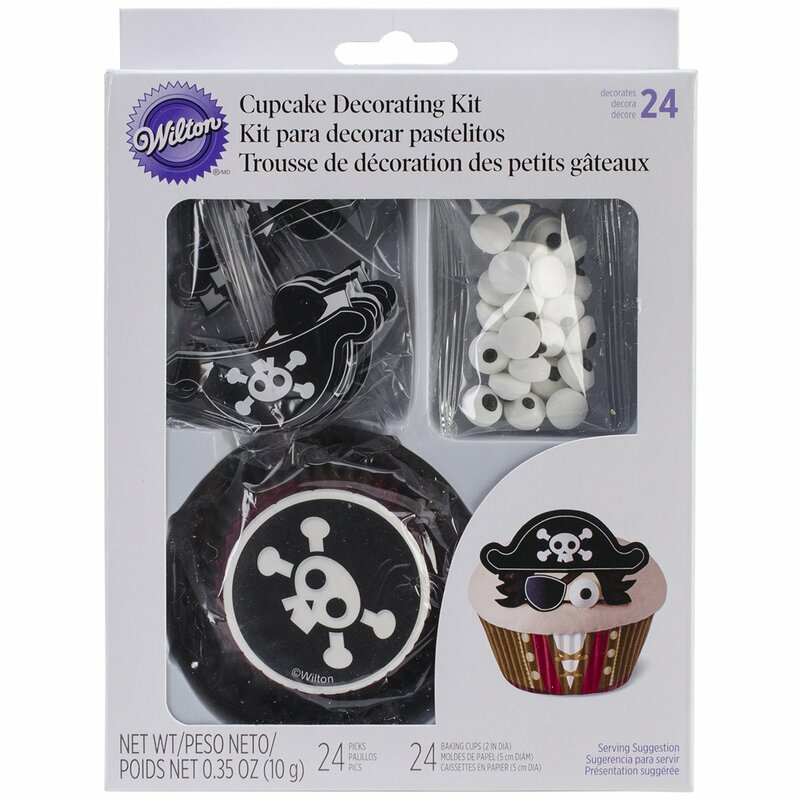 2: Skull Cake or Cupcake Toppers: For a Halloween pirate theme, how about having candy skulls as the main topper on a cake or cupcake and then building up your chocolate, candy and sweet treasure around it. Eat the treasure if you dare. 3: X Marks the Spot: In pirate land, X always marks the location of treasure. Why not make the top of your cupcakes look like sand, pipe an X in icing on the top and half-bury some shiny candy treasure into it to be picked out and eaten by young adventurers. 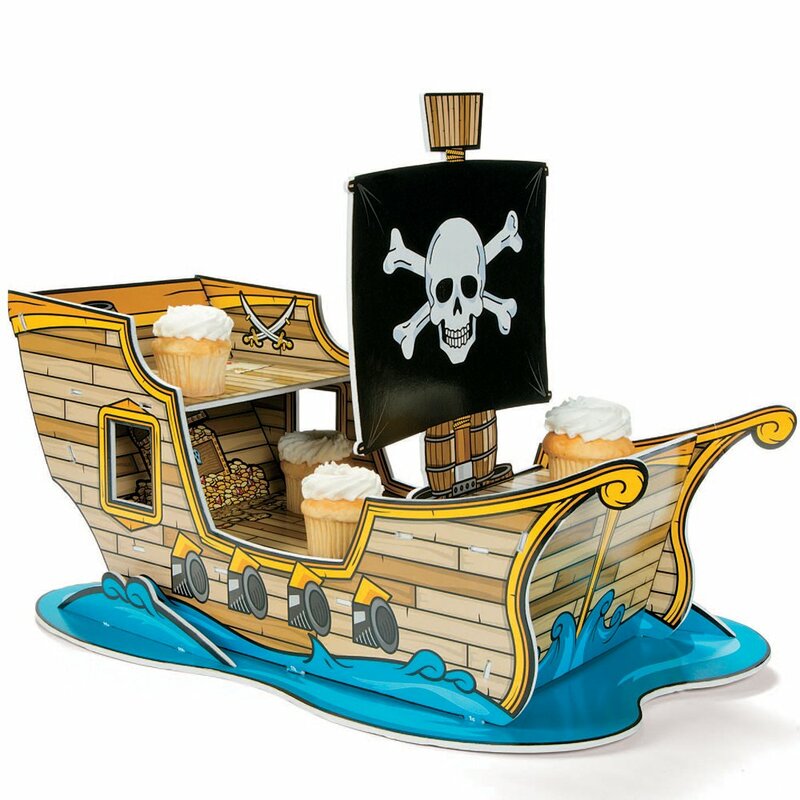 Hope that gave you some fun sea-faring cake decorating ideas, me landlubbers!